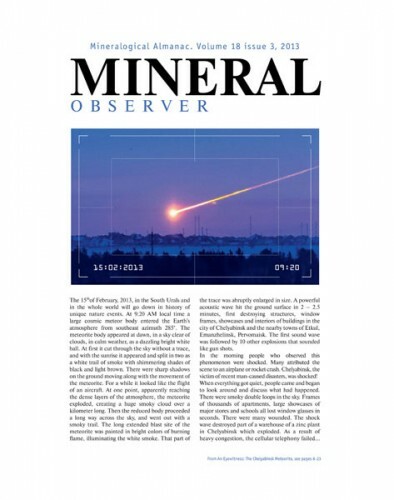 MINERAL OBSERVER Mineralogical Almanac, volume 20, issue 1, 2015 The issue presents information covering all our regular themes. In the section “Famous Mineral Localities” we publish an article, with many pictures, on the Banská Štiavnica mining district by A. Russ and S. Jelen (Slovakia) that includes brief historical review of mining activity, short description of geology and data on the most interesting minerals. The phenomenon of parallel crystal groups growth is discussed in article by B.Z. Kantor (“A Guide to Ontogeny of Minerals” column). First data on Kamenushinskoe, a new locality of fine specimens of azurite and, especially, malachite recently found in Siberia are given in the section “Discovery of the Year”. Our reports cover several mineral shows of the last third of 2014: Gemma in Moscow, Jewelry Olympus in St. Petersburg, Mineralientage in Munich and the Denver Show. A highlight of the issue is mineral paintings by an artist V.L. Shcherbina who demonstrates now the series “Masterpieces of Eastern Europe from the Fersman Mineralogical Museum”. A brief report from England, where the Mindat UK Symposium-2014 took place, and the Photo Gallery in which S. Wilensky presents Mineral Treasures of the United States, concludes the issue. 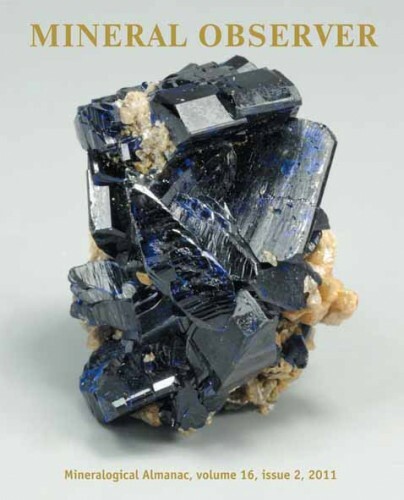 88 pages, 189 illustrations including 118 mineral photos, and 12 mineral paintings. MINERAL OBSERVER. 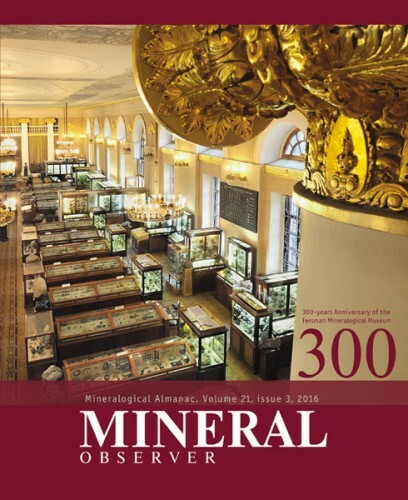 Mineralogical Almanac, volume 20, issue 2, 2015 The main articles of the current issue devoted to Victor Ivanovich Stepanov, the prominent Russian mineralogist and minerals collector. Some articles are dedicated to this eminent scientist and person, to the memories of his disciples and colleagues, and to the description of his collection donated by V.I. Stepanov to the Fersman Mineralogical Museum, RAS. This year has also been marked by a very interesting mineral show in Tucson, and this is why we decided to include in this issue a number of articles describing its numerous exhibits. Also we report about “Mineral and Gem” Show in Sainte-Marie-aux-Mines (France). We keep treating the topic of the minerals' ontogeny by publishing the “A Zeolite Harmony” written by Boris Z. Kantor. Several pages are dedicated to the current exhibitions, jubilees and new finds. 104 pages, 264 illustrations including 173 mineral photos. 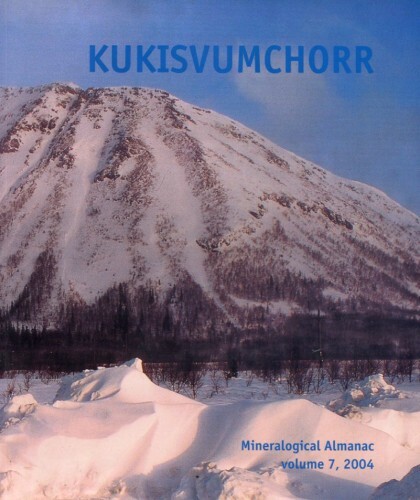 MINERAL OBSERVER Mineralogical Almanac, volume 18, issue 3, 2013 We open this issue of Mineralogical Almanac by an article of Sergey V. Kolisnichenko, who witnessed the Chelyabinsk meteorite fall. This event made all mankind to shudder in horror, since geological evidence proved that it could cause a global catastrophe. Victor K. Garanin, a new director of Fersman Mineralogical Museum RAS wrote an article discussing achievements and problems of Museum in historical aspect. Ontogeny of minerals section is resumed in our magazine by an article of Boris Z. Kantor dwelling on “white stripe” in quartz crystals. Terry Huizing, an outstanding collector, living in USA, is presented by an article of Carl A. Francis. Our usual show report section devoted to Tucson (USA), Saint-Marie-aux-Mines (France) and “Jewelry Olympus” competition (Saint-Petersburg, Russia). 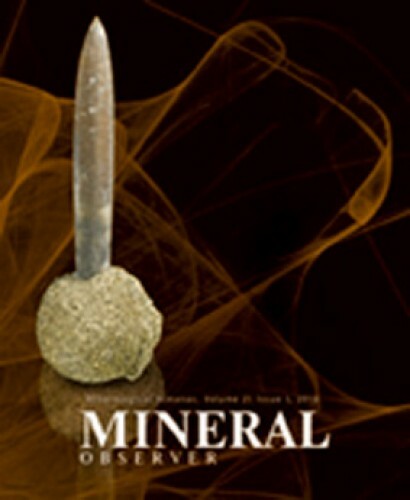 96 pages, 315 illustrations including 147 mineral photos. 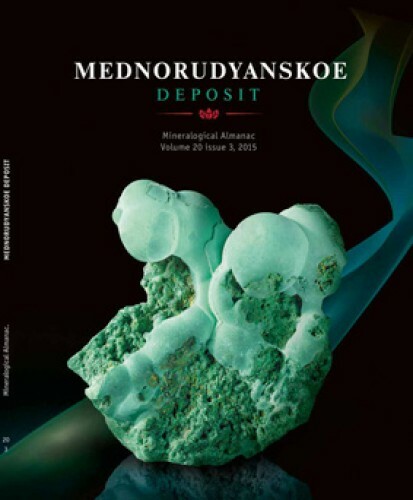 This issue is focused on the Mednorudyanskoe deposit in the town, Urals, Russia. The early 19th century, it was the largest malachite deposit worldwide. It provided not only magnificent material for decoration of halls in palaces, cathedrals, artworks, and jewels, but numerous remarkable museum hand specimens. Excellent specimens of not only malachite, but libethenite, pseudomalachite, reinchanbachite, and some other minerals come from the deposit up to now; brochantite and delafossite were discovered here. Many outstanding scientists studied the Mednorudyanskoe deposit. At present, 103 minerals were found at the deposit including 42 minerals from primary ores and other from the oxidation zone. The original and previously published data on mineralogy of the Mednorudyanskoe deposit are summarized. Famous Mineral Localities of Russia Vladimir A. Popov, Valentina I. Popova, Ivan A. Blinov, Vladimir S. Ponomarev Minerals of the Mednorudyanskoe Deposit, Russia. 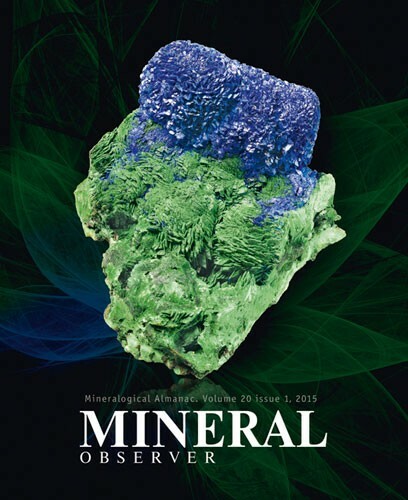 Mineralogical Almanac, volume 20, issue 3, 2015. 128 pages, 244 illustrations including 178 mineral photos. 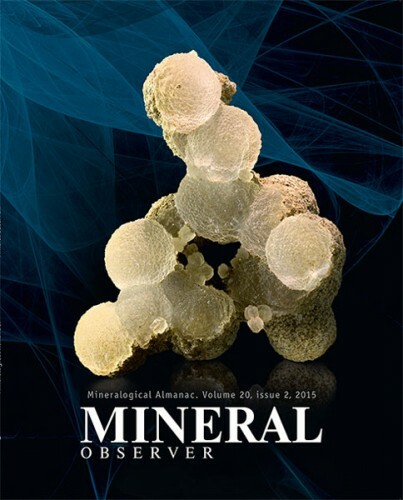 MINERAL OBSERVER Mineralogical Almanac, volume 21, issue 1, 2016 This expanded issue of Mineral Observer dwells on wide range of topics covering different aspects of mineralogy and mineral collecting. Two articles are devoted to Kamenushinskoy copper deposit in Siberia, where fine specimens of malachite and azurite have been found recently. Vladimir S. Lednev describes briefly geological setting of the deposit and oxidation zone structure. Boris Z. Kantor gives a comprehensive analysis of malachite and azurite aggregates and crystals formation and intergrowth. 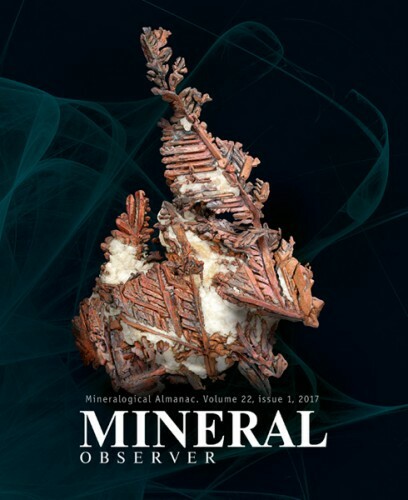 Museum section of the issue includes an article by Andreas Massanek and Gerhard Heide on a national mineralogical collection at Krügerhaus in Freiberg (Saxony, Germany). Fundamental problems of scientific mineral collecting discussed in an essay by Igor V. Pekov, Nikita V. Chukanov. Personality section includes two articles: John S. White, a mineralogist, particularly famous among collectors all over the world, tells his life story; Vladimir I. Pavlishin, prominent Ukranian mineralogist makes a historical review feachering two Russian mineralogist – Liya K. Yakhontova and Vasilii M. Severgin. As usual we publish short notes on some new finds and reports on world mineral shows in Moscow (Russia), Denver (USA) and Munich (Germany) 120 pages, 294 illustrations including 223 mineral photos. 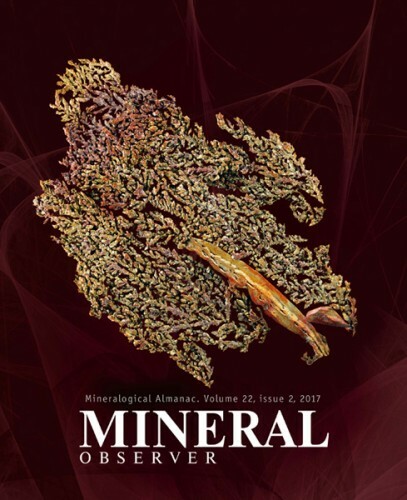 This issue of Mineralogical Almanac is devoted to the Saranovskoe chromite deposit at Middle Urals. This deposit known for almost two hundred years is a unique mineralogical object, particularly as a source of great diversity of unusual Cr-bearing minerals. Among mineralogists and collectors Saranovskoe is famous for nice specimens of uvarovite, shuiskite, redledgeite, millerite, Cr-enriched varieties of titanite, amesite, diaspore, kassite, and pumpellyite-group and chlorite-group minerals. Crystals of grimaldiite and guyanaite were first found here. At present 111 mineral species are known at the Saronovskoe deposit. Rich and unusual mineralization is a result of the interactions of chromitic rocks related to layered gabbro-ultramafic intrusion and hydrothermal solutions produced by dolerite dikes. 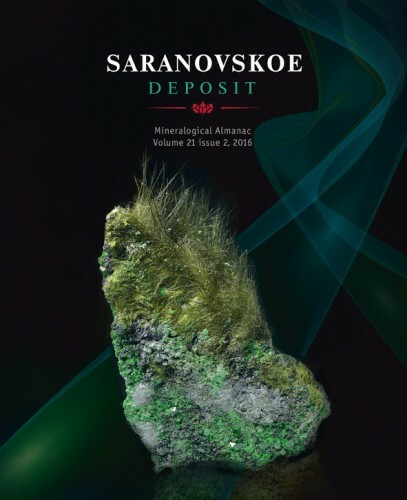 The data on the mineralogy of the Saranovskoe deposit are summarized including results of author’s long-time studies, a review of all previously published data and description of interesting recent mineral finds. Mineralogy of Saranovskoe Chromite Deposit (Middle Urals), Mineralogical Almanac, volume 21, issue 2, 2016 Famous Mineral Localities of Russia Oleg K. Ivanov 128 pages, 261 illustrations including 179 mineral photos. Main article by Irina I. Kupriyanova and Nikolay N. Krivoshchekov devoted to beryllium minerals of the unique Ermakovskoye deposits in the Eastern Transbaikal Region. Boris Z. Kantor devoted his ontogenic column to unusual calcite from India. Two articles devoted to the eminent persons of the mineral world: Nikolay P. Yushkin, Academician, mineralogist, and Wendell Wilson, the Publisher and Editor-in-Chief of the famous American magazine Mineralogical Record. The phenomenon of mineral collecting is discussed again on the pages of our magazine in an article of Boris Z. Kantor. As usual we publish reports from some Mineral Shows, held in the first half of the year in Tucson (United States), Moscow (Russia) and Sainte-Marie-aux-Mines (France). 96 pages, 223 illustrations including 156 mineral photos. 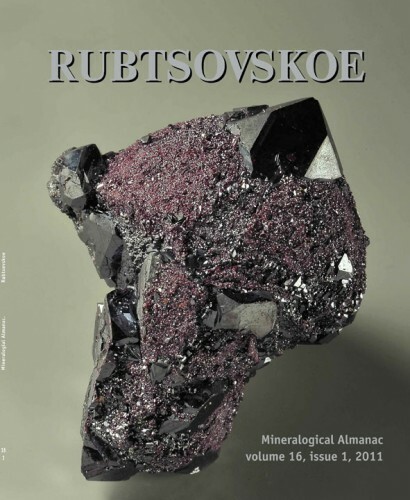 This issue of the Mineralogical Almanac is devoted to the mineralogy of the oxidation zone of the Rubtsovskoe base-metal deposit located in the north-west part of Rudnyi Altai (Altai Krai, Russia). This deposit, that has been operated as the Rubtsovsky mine of Siberia-Polymetals OJSC since 2005, became famous due to remarkable finds of supergene minerals. Uniquely rich iodide mineralization was discovered here. Rubtsovskoe is also a source of top-level specimens of native copper, cuprite, marshite, miersite, and iodargyrite. The issue contains the results of original mineralogical studies of the oxidation zone of the Rubtsovskoe deposit; 40 supergene minerals are described. 96 Seiten, 167 farbige Abb., 2011, broschiert. In englischer Sprache! The article by Vasiliy N. Orlov on Gold Nuggets found in the Magadan Oblast and Chukotka Peninsula and displayed at the exposition of the Diamond Fund of Gokhran of Russia, is the lead article in this issue. All displayed nuggets are described in detail and are photographed for the first time. Boris Z. Kantor devoted his regular column to the term druza which is widespread in Russian mineral literature. The column "Jubilee" contains an article by Vladimir I. Pavlishin hosting this column about Alexander V. Sidorenko, an outstanding geologist whose creative way was marked by epic discoveries, and an article by Nadezhda N. Krivitskaya and Sophia K. Ryakhovskaya about Marina S. Sakharova, a wonderful scientist and teacher of the Lomonosov Moscow State University. Bob Jones, an outstanding American Collector, Writer and Editor wrote about himself in the column "My Mineralogical Journey". Two articles in the column "Travels for Minerals": first by Victor A. Slyotov remembers his travels to Shurab, Tajikistan, for celestine; second, Mikhail V. Tsyganko with colleagues tells about a Karst Cavity with Calcite Druses in the “Krasnaya Shapochka” Mine, Northern Urals, Russia, and the third article by Mikhail M. Bitman describes findings of skeletal quartz in Lugansk Oblast this spring. Notes on Mineral Shows – Denver-2016 and Tucson-2017, "Virgin Russia" photo exhibition, and Spring Gemma-2017 are also included. And two great Photogalleries – one by Stuart Wilensky and another by Marcus Budil – are real “pearls”of the issue. 96 pages, 216 illustrations including 158 mineral photos.